Charlene Thompson is Kevin Thompson's mother. 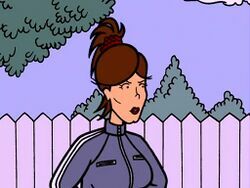 She and her husband, Doug are first mentioned in The Daria Database and later appear in the episode, "Mart of Darkness". According to the ages given in The Daria Database, Doug and Charlene were 18 when Kevin was born, which is confirmed in "Mart". She dislikea Kevin'a girlfriend Brittany Taylor, as she think she is a bad influence on her son; she's afraid Kevin will get Brittany pregnant, and will then have to get a job and not go to college. Doug's response was "I'm sure Kevin will be more careful than we were [laughs]" (she didn't find that funny). She phrased the pregnancy issue as "that girl's gonna get in a family way", placing the blame on Brittany and not mentioning Kevin's involvement, and "Database" says she "doesn't think Brittany is good enough for her son". She almost certainly was at school with either Wind Lane or Summer Lane or both, as both appear to be in their 30s as well. This page was last edited on 6 April 2018, at 15:18.